Once upon a time... the scarf world changed. I loved scarves, but I wanted scarves that were easy to use and comfortable. So I designed them! Since 1991 I have been making Easy Scarves©, they are copyrighted original scarf designs that are worn without tying. 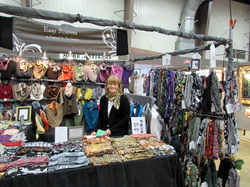 Over the years the Easy Scarves© grew from one to four no tie scarf designs. Thanks to my designer shapes anyone can have great looks the Easy Scarf way, comfortable yet flattering, elegantly eye catching yet simple to use. I still enjoy working with every customer! I have many happy repeat customers, who have discovered that my designs make the difference. Easy Scarves are scarves anyone can look and feel great in. I love showing people that they can finally have an easier to wear scarf, scarves are the prettiest accessory. Every scarf is a limited edition, this means I make a certain number of each style and fabric. All styles are made by me in America. Each fabric is hand chosen for color, design, wear ability and quality.Give one a try, maybe you’ll find one that you’ll treasure for years, happy customers tell me they have.